292 pages | 10 B/W Illus. 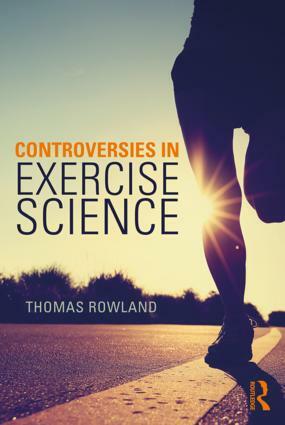 Controversies in Exercise Science introduces a series of selected unresolved issues in the field of human exercise science. The common thread to all of these topics is that, in their ultimate resolution, they offer promise of insights into the essential principles of physiological systems and how these respond to the stresses of exercise. Each case study includes an examination of research surrounding each issue; the innovative aspect, however, will be that each of these controversies will be presented in the context of an historical and/or philosophical perspective. These chapter include topics related to basic exercise physiology, sports, physical activity, and exercise health. Underlying each of these debates lie clues which may offer insights into the basic nature of living beings. Aimed at both academics and practitioners in the fields of exercise science, biology, and related sports science disciplines, Controversies in Exercise Science provides arguments for both sides of several selected contemporary controversies in the field of exercise science and, while no ultimate resolution will be provided, the goal is, rather, to offer the reader sufficient "raw material" on which he or she might make their own judgement on the matters presented. 1. What Limits Training-Induced Improvements in Athletic Performance? 2. Why Do Physiological and Chronological Time Differ? 3. Why Was Zeno Wrong? 4. What Explains the Mysterious Ubiquity of Biologic Variability? 5. What Caused the Disturbing Collapse of this Young Athlete? 6. Is There Biological Regulation of Physical Activity? 7. How Can a Baseball Player Hit a 95-mph Fastball? 8. What is the "Purpose" of the Cardiovascular System? 9. What Causes Exercise-Induced Hypoxemia in Athletes? Insights from Saratoga. 10. Is There a Biological Basis for Children’s Reduced Aerobic Trainability? 11. How Can Music Enhance Physical Performance? 12. When is Iron Supplementation Indicated for Athletes with Iron Deficiency? 13. Who (or What) is Setting the Pace? Thomas Rowland, M.D., is the retired Chief of Pediatric Cardiology at the Baystate Medical Center in Springfield, Massachusetts, USA, where his research focused on exercise cardiovascular physiology in children. He is the author of over 200 peer-reviewed articles and ten books, including Children’s Exercise Physiology and Biologic Regulation of Physical Activity. He was the founding editor of the journal Pediatric Exercise Science, a post he served for 23 years. He was a member of the Board of Trustees of the American College of Sports Medicine and has served as president of both the North American Society for Pediatric Exercise Medicine and the New England Chapter of ACSM. He received the Honor Award from the latter organization in 1986.